Eva doesn’t seem to be interested in any of the books or playthings her SLP typically uses, and reinforcer preference testing was inconclusive. Zach tends to grab the teacher’s materials and put them in his mouth, or sometimes bang them on a hard surface. Bryce often engages with them for a few seconds then drops or throws them. Do you work with students like these? They have lots of AAC learning ahead of them, but creating therapy sessions or instructional lessons is a challenge because of the ways in which they interact with the materials. For some students, keeping the number of materials to a minimum can be helpful. Here are a few things to try. Create activities where the focus is on movement rather than on materials. Create a simple movement game or make up your own version of a childhood classic (e.g., Red Light, Green Light) that involves using their language and AAC skills. If you’re working on core words, for example, students can move forward when they say or hear one of their target words (Green Light) and stop when they hear another kind of word (Red Light). 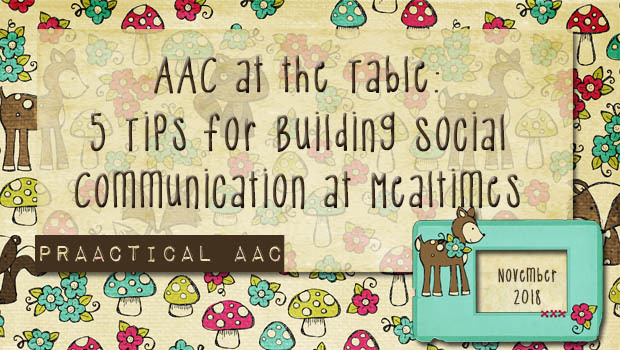 Get creative and change the ‘rules’ of the game so that it suits your purposes: AAC learning and engagement. Once you’ve done it a few times, the AAC learners will know what to expect and are likely to participate more readily. Develop routines using fingerplays (for the littles) or gestures/pantomime (for a more age-respectful version). Use the classics such as Open, Shut Them, 2 Little Blackbirds, and Where is Thumbkin or make up your own (click here for more fingerplay ideas). Coactive movement activities, like Row Row Row Your Boat, and songs with movement (think The Grand Old Duke of York) may work for older children, too. Modify them to suit your own purposes so that there are practice opportunities for target words/sentences and use extra pause time to elicit participation. 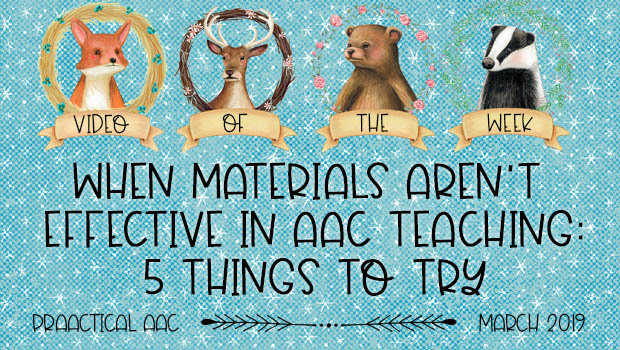 Toss or roll your way to AAC language practice! Create communication opportunities around a corn hole board and use AAC before/after tossing those bean bags. Even simpler, create a ‘game board’ on the floor by taping AAC symbols down. We can make a sentence with the word that our bean bag landed on to practice saying our target words. If your students can deal with materials placed at a distance, you can tape the symbols to plastic bowling pins and make sentences with the words that you knocked down. Secure the materials to the table. Packing tape can keep a communication board in place so that it is available for modeling and communication. Use dry-erase markers or painters’ tape to outline roads and parking spaces for the cars (like this). Or use them to ‘draw’ rooms of a building so that you can do pretend play with character toys, dolls, and animals. Print out emoji images with different facial expressions and accessories. Tape them to the table top so that we can talk about them and play with them. In one session, we created an emoji ‘pathway’ and as we ‘drove’ the car down the path, we stopped on each emoji to talk about how it was feeling, what it was wearing, etc. Take photos together. Even the most reluctant participants tend to like to take photos and see pictures of themselves and scenes from their daily experiences. Most therapists/teachers use a phone to do this but don’t overlook the cameras built into some of the SGDs and mobile devices. Take photos of yourselves in action, the parts of the classroom/therapy room, close-ups of learning materials and toys, views from the window, etc. 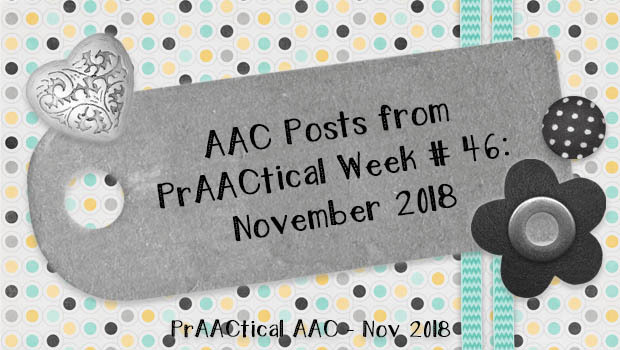 Think of all the language that we can use as we narrate our picture-taking experience and slow down to elicit comments from our friends who are learning to communicate with AAC! The possibilities are endless. Plus, once you have the photos, you can create collages, add filters, and use them to make books. Even children who don’t care much for ‘regular’ books tend to really engage with books that feature the people, places, and things that they see in everyday life. Do you have tips for working with learning learners who need us to keep the external materials to a minimum? We’d love to hear about them. Core word battle ship! Place core words on the axis instead of the numbers and letters.